Like most students, sophomore Robert Cornejo came into high school full of curiosity of where life will take him. Within his first year, his likes, interests, and passions were altered. A love for a sport quickly developed within Cornejo and grew into his future goal. 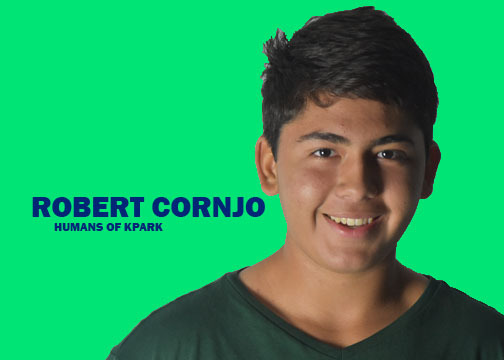 During his freshman year at K-Park, Cornejo joined the KP tennis team after the head tennis coach, Wade Bartels, prodded him to get out of the P.E. period and try out for tennis. Cornejo had never picked up a racquet before that year but was eager to try his hand in a new sport. Now Cornejo has been playing tennis for a little over a year and hopes to make it his profession. “I just felt it right here and here,” said Cornejo, pointing first to his chest then to his head as he explained why he’s choosing to go professional. Cornejo practices during and after school everyday. Before playing with the team during fifth period JV boys tennis, he makes sure to say a prayer and run out to be the first on the court. “I love hitting volleys back and forth with me” he said with his hands making small swinging motions. He also spends a lot of his time at the Deer Ridge tennis courts where he plays his twin sister Victoria and meets new opponents as well. “I practice with David, he’s like 40 years old. I met him at the tennis courts. He’ll ask me ‘Are you ready?’, and then goes POW,” Cornejo’s face lights up as he reenacts a serve. Other names trail from his lips of opponents he’s played or friends he made, each person inspiring him to become a stronger player. While Cornejo knows the difficulty of pursuing sports professionally, he has a goal set and intends to make it there. He practices three to four hours everyday and looks to professionals such as Roger Federer and Rafael Nadal to keep up his efforts. His hopes are to strengthen his serves and have a fun, successful year playing competitively for the school.